The popular 8-gallon, two-stage, gas-powered, medium-duty air compressor comes equipped with a 10- or 16 1/2-in. flywheel for extra cooling and longer life, a cast iron cylinder, and splash-lubricated cast iron crankcase. 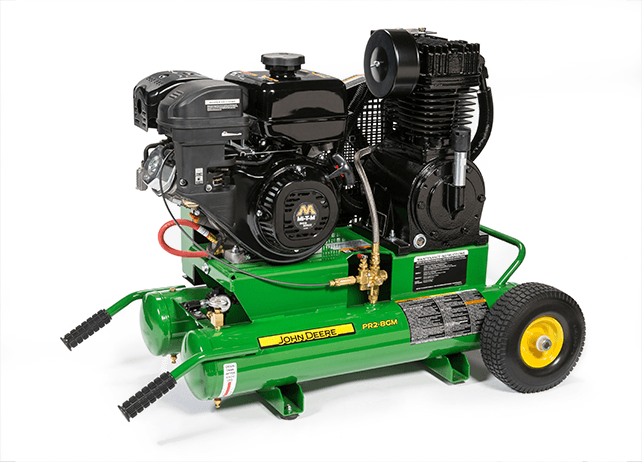 The 8-gallon twin tank receivers are powder-coated in high-gloss John Deere green. This unit carries a 1-year limited warranty.